This past Saturday, just before Hurricane Irene blew through, I led our Advanced Naturalist Club on a botany walk at Nottingham Park, Chester County, PA. Janet Ebert, professional botanist, was our special guest expert who identified many rare and unusual plants. Janet Ebert, on the left, shows the group one of the unusual plants found at Nottingham Park. We kept her busy for the morning asking her what was what. Janet is very hard to stump, and knows just about everything growing there. 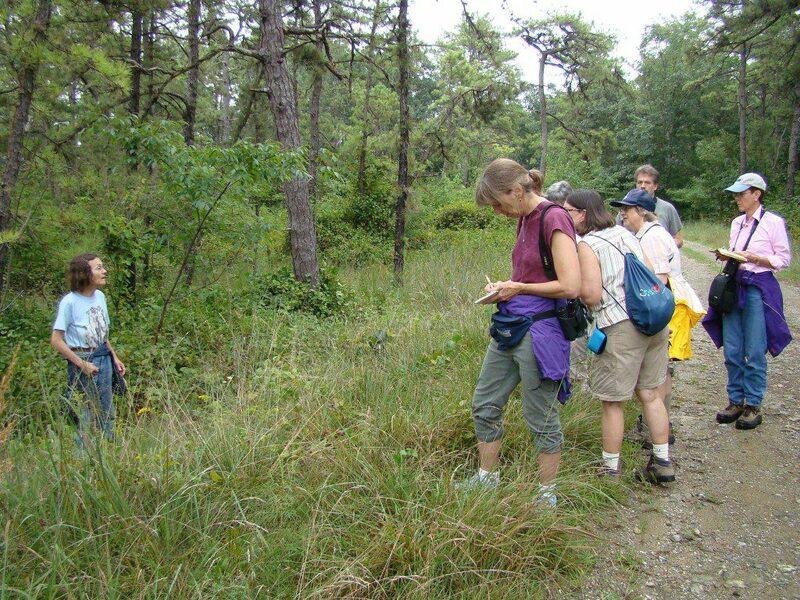 Nottingham Park, in the southwestern corner of Chester County, PA is a large serpentine barrens. This kind of habitat is usually dry, rocky, and the soil is rather barren, and high in heavy metals. It is the kind of place where most of the usual plants in our area have a tough time growning, and rare and unusual species thrive. 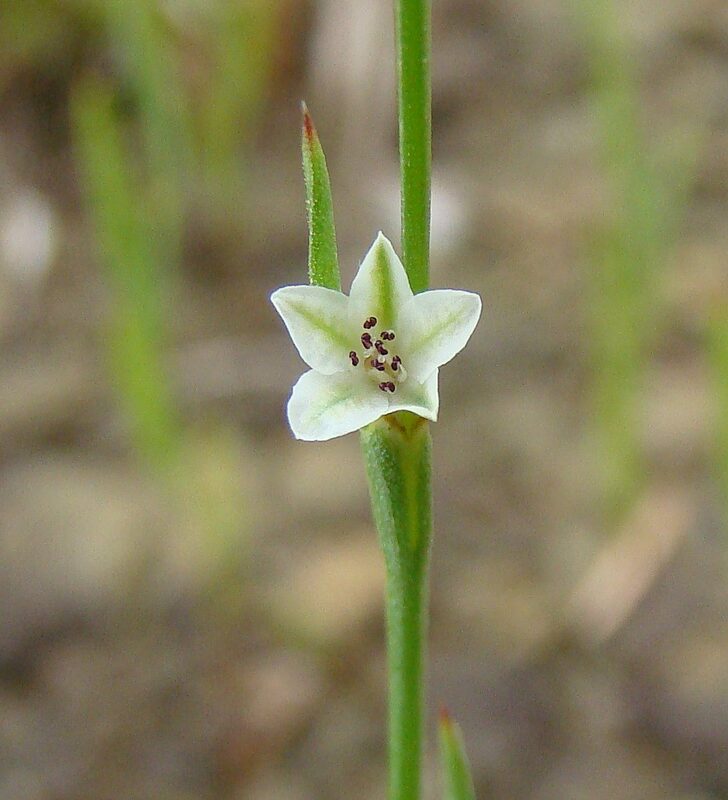 The pleatleaf or slender knotweed is a small plant that is rare in our area outside Serpentine Barrens. The pace of the walk was slow, as is most walks with Janet. This is a good thing, because we discovered many small plants that survive in the hot, dry, barren conditions of Nottingham. The pleatleaf knotweed, above, was a good find growing among small grasses in the savannah-like habitat found here. 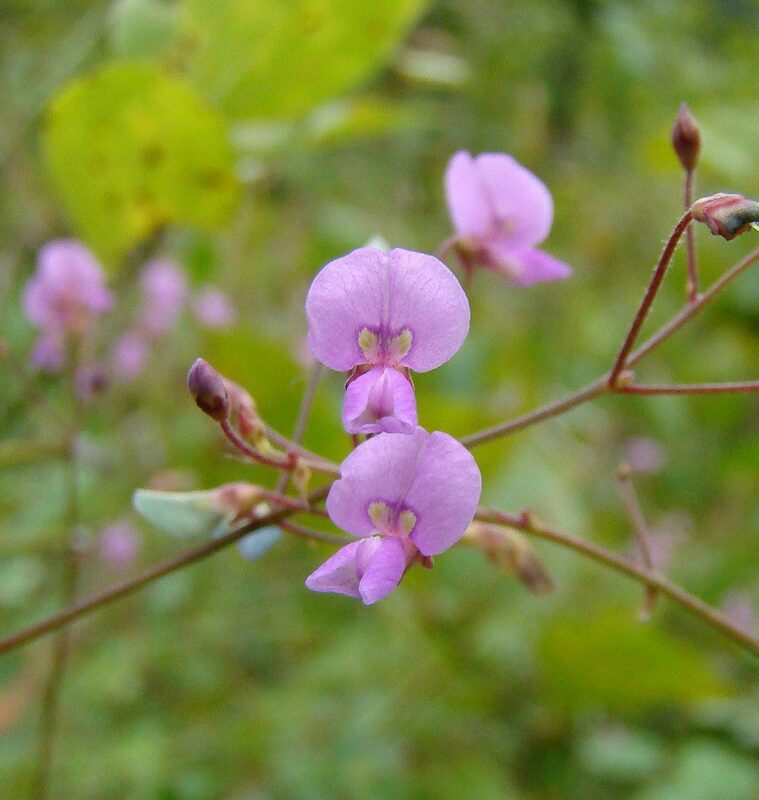 This small but beautiful member of the pea family is a type of tick trefoil. 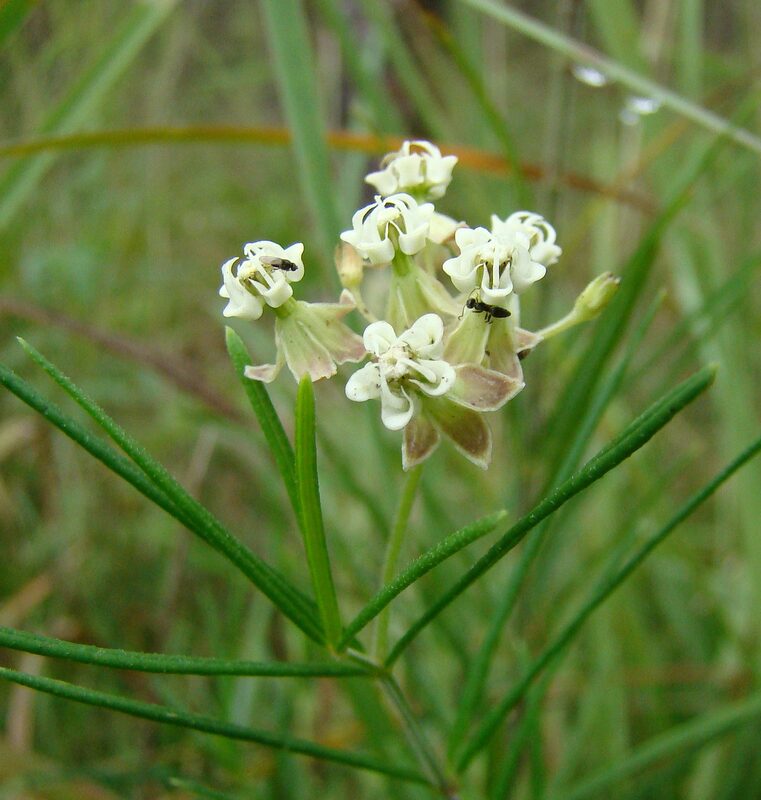 Whorled milkweed is a small, delicate member of the milkweed family that grows in dry, rocky areas. I think if a monarch caterpillar tried to feed on this one, it would weigh it down to the ground. 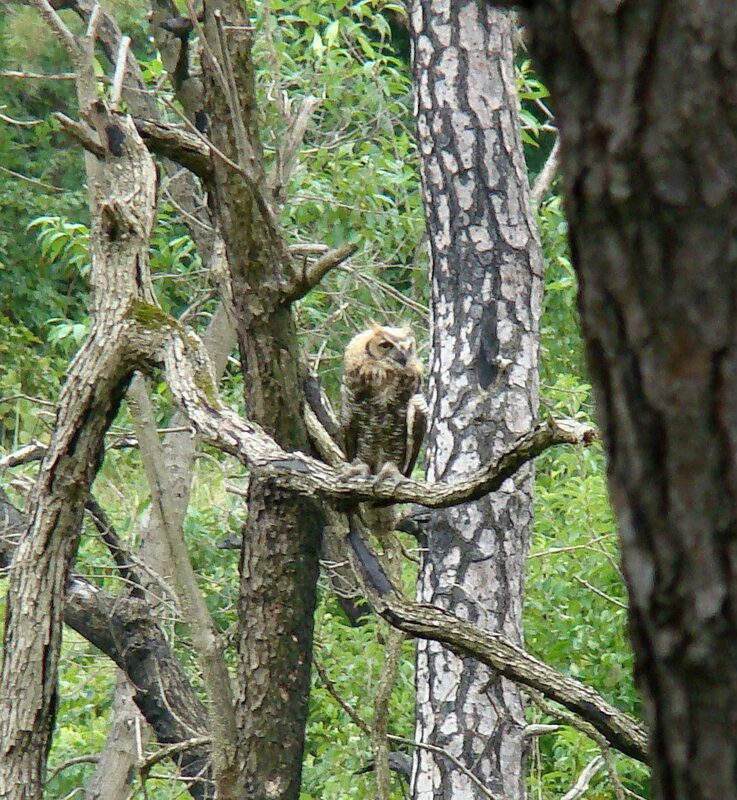 This Great Horned Owl seemed tame, and looked like it might have an injured left wing, which drooped a little. We assumed it could fly, since it was perched in a tree. 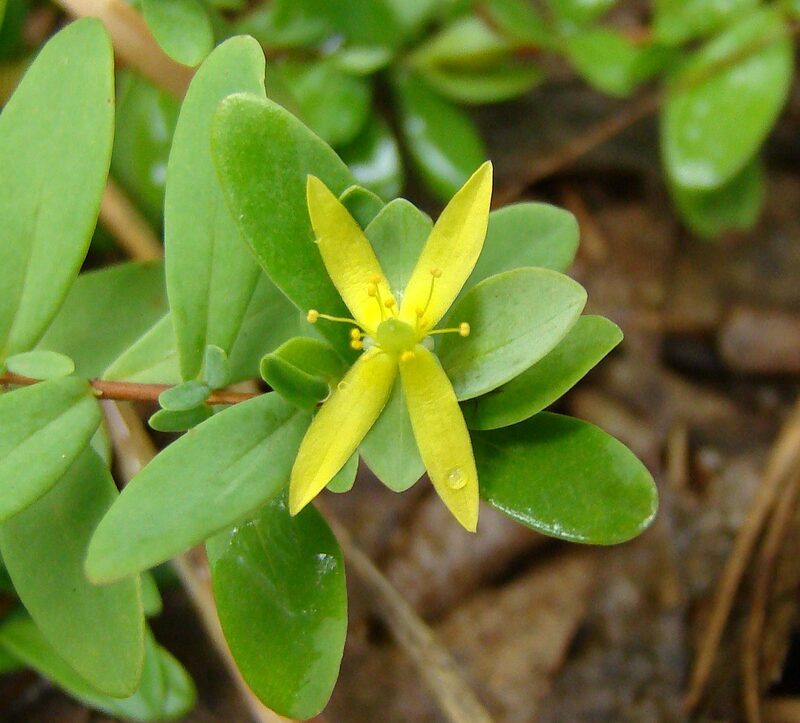 St. Andrew's cross is rare in Pennsylvania, growing as a mat on dry soils. 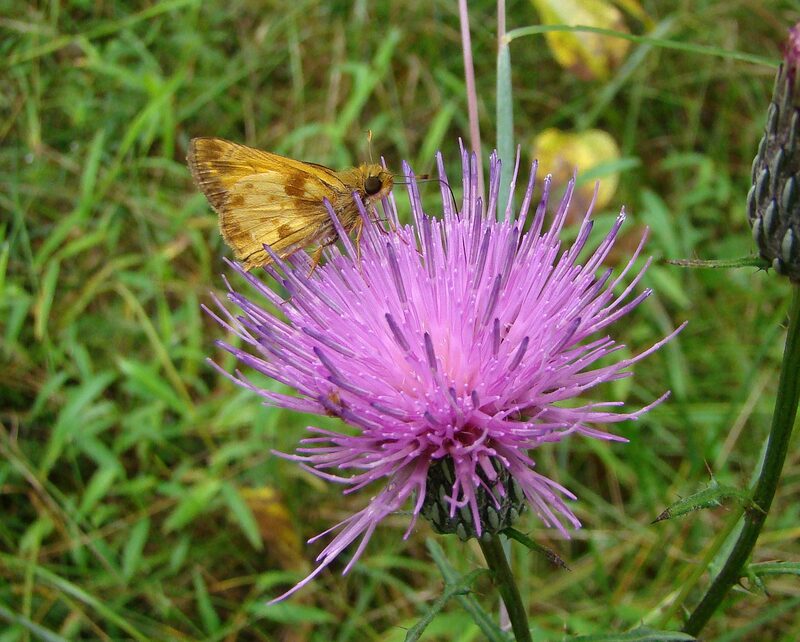 It was not a good butterfly day, since it was cloudy and a little rainy, but we did find a Zabulon Skipper nectaring on a swamp thistle, which is a native thistle growing in Nottingham barrens. An adult male Ruby-throated Hummingbird visits a Cardinal Flower in search of nectar. Image by Hank Davis, August 23, 2011. Late August brings the peak of fal migration for the Ruby-throated Hummingbirds in our region, and the reports coming in this week tell us that these tiny birds are reaching peak numbers in local backyard feeding stations. The feeders at the Ashland Nature Center this week drew 6 or 8 hummingbirds at a time, battling for space at the sugar water ports. I have heard of other feeding stations that are swarmed by literally dozens of hummingbirds. Both adults and this year’s juvenile humingbirds are stocking up as they undertake their migration to winter in Central America. 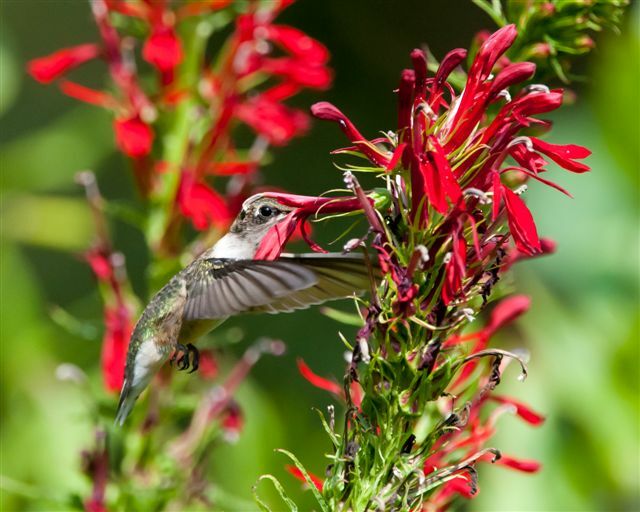 A female Ruby-throated Hummingbird reaches deep into a Cardinal Flower with her long beak. Image by Hank Davis, August 23, 2011. One of the best ways to watch these amazing birds, though, is at a natural nectar source. 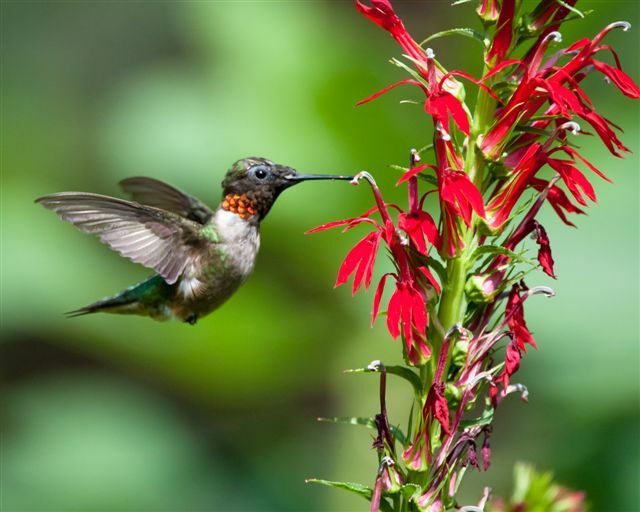 The Ruby-throated Hummingbird has a noted preference for red-colored flowers and the Cardinal Flower (Lobelia cardinalis) is a highly-desirable food source for hummingbirds. Local photographer Hank Davis, of Harold Davis Photography, is capturing incredible images of hummingbirds visiting the flowers in his backyard. He graciously shared these photographs with us to be enjoyed by the readers of this blog. A male Ruby-throated Hummingbird hovering-- a challenge to capture with camera! Image by Hank Davis, August 24, 2011. 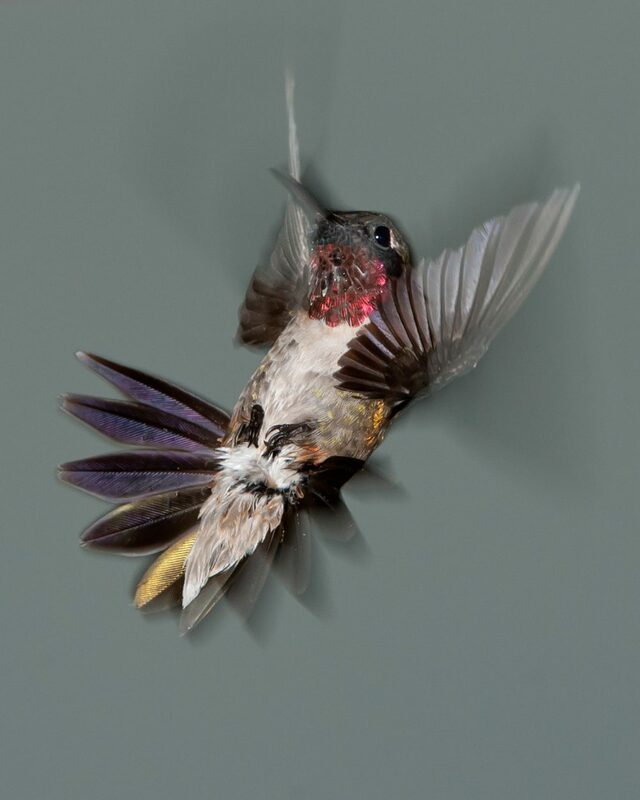 The beauty of hummingbirds is easier to appreciate when captured in the fine detail of Hank’s photographs. The iridescence of their feathers is incredible, and the speed at which they beat their wings (60+ times per second) is truly remarkable. Early this afternoon, as the first heavy bands of rain from Hurrican Irene lashed down, I walked into the marsh at Ashland to take some pre-flood photographs. There along the boardwalk I found a lot of hummingbirds actively feeding on the blooms of the Jewelweed plant. These birds are stoking up on fuel to help them hang tough as the conditions deteriorate in the next 24 hours. The high winds and flooding associated with this storm will undoubtedly destroy many of the flowers that these hummingbirds feed on. If you have a hummingbird feeder, you may likely see a lot more hummingbirds visiting right after the storm. They will be thirsty, and you will be serving up their favorite cocktail. Should we call it a Sugar Water Hurricane? 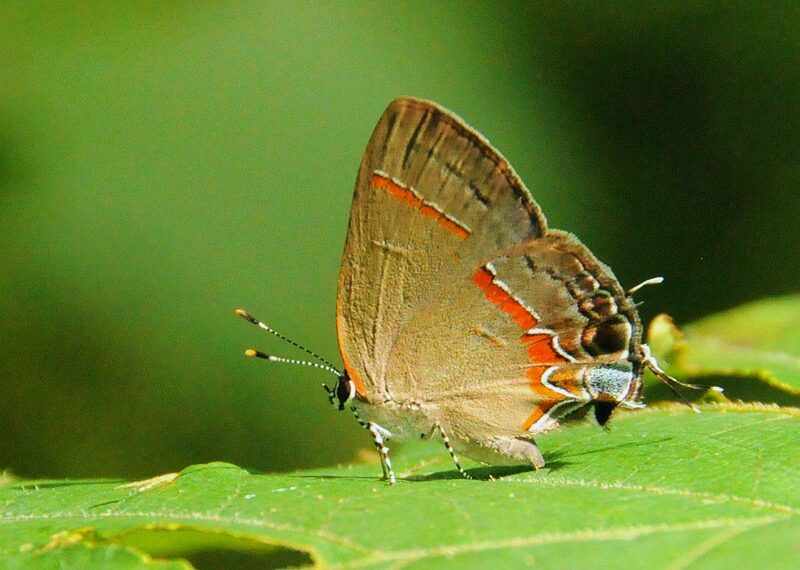 A Red-banded Hairstreak basking on a leaf at Coverdale Farm Preserve. Image by Derek Stoner, July 30, 2011. Way back on July 30(more than three weeks ago now! ), the Delaware Nature Society took part in the North American Butterfly Count. A crew of four citizen scientists helped to survey the butterfly populations at both Ashland Nature Center and Coverdale Farm Preserve. The results, in butterfly terms, were impressive! In two hours of walking the fields at Ashland, we observed and identified 27 species of butterflies. A more typical count in previous years has been 15-18 species at Ashland, but this year seemed to be excellent in terms of species diversity. We tallied 9 species of skippers (those tiny, mostly orange and brown specks with scaly wings) and noted uncommon species like Crossline Skipper, Dun Skipper, and Hobomok Skipper. 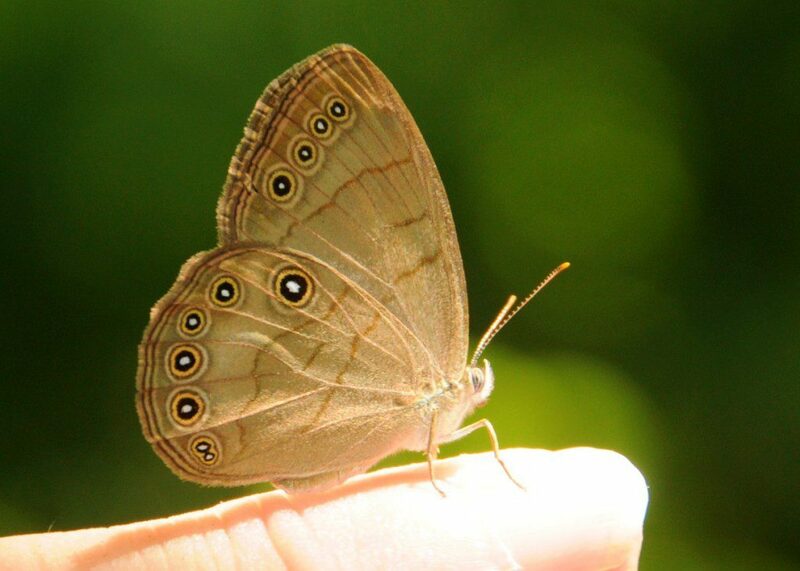 An Appalachian Eyed Brown perching cooperatively on the finger of Jill Constantine. Image by Derek Stoner, July 30, 2011. On the Ashland grounds, we also found beauties like the Appalachain Eyed Brown, Red-spotted Purple, Red-banded Hairstreak, and Great Spangled Fritillary. The nectar sources (flowers) were widely scattered and so were the butterflies. Patience, and a quick butterfly net and snap of a digital camera, allowed us to net a good variety of butterflies. Chris getting his camera up-close and personal with a pair of Appalachian Eyed Browns. Image by Derek Stoner, July 30, 2011. We discovered a great technique for studying and photographing small butterflies. 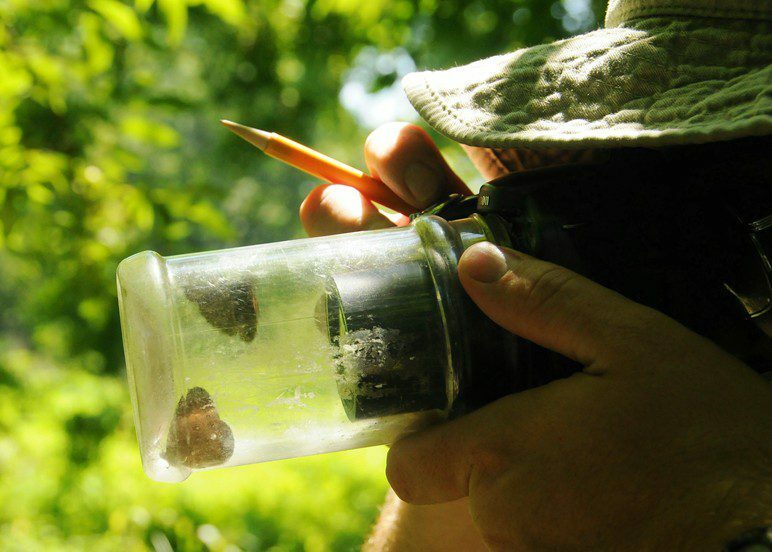 After I caught butterflies in a net, Jill placed the fragile creatures inside a plastic jar and inserted her digital camera into the opening of the jar. The photos showed the butterflies’ detail very well, and thus was born the saying “It’s like shooting butterflies in a jar.” Easy, simple, and effective. 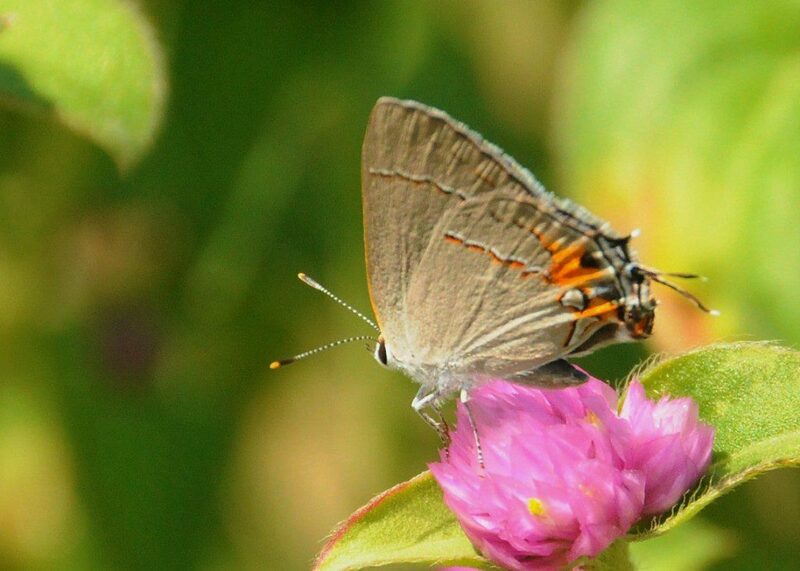 A Gray Hairstreak visits a flower in the Community Supported Agriculture garden at Coverdale Farm. Image by Derek Stoner, July 30, 2011. In the afternoon, we spent three hours touring the gardens, meadows, and forest at Coverdale Farm Preserve. Joined by Sheila Vincent (Delaware Nature Society’s Butterfly guru), we found a bonanza of butterflies congregating on the flowers in the CSA garden. Zinnias, sunflowers, and Bachelor’s Button’s attracted 13 species of butterflies with standouts like Gray Hairstreak, American Lady, Variegated Fritillary, and Buckeye grabbing our attention. 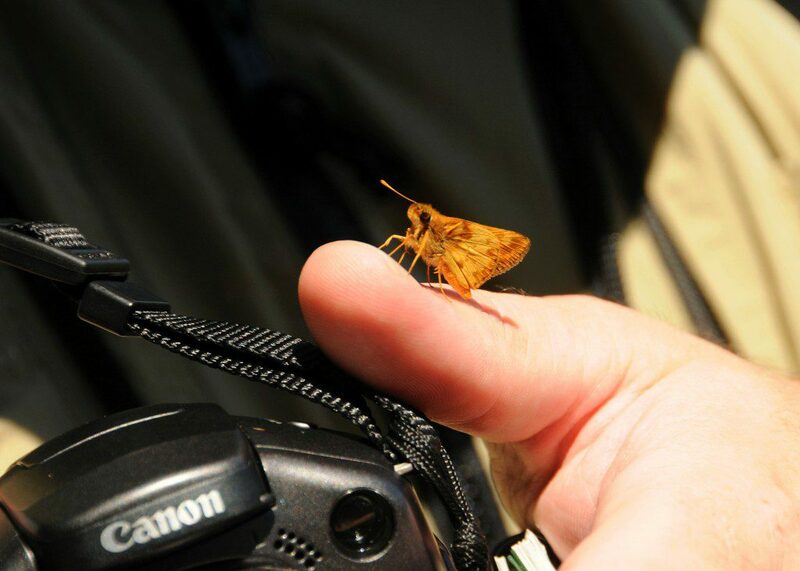 A Zabulon Skipper enjoys a visit on Chris's thumb, and gets close to the Canon camera. Image by Derek Stoner, July 30, 2011. The Butterfly Count provided many opportunities for close observation of these beautiful insects. For the day we tallied 31 species of butterfly, and obtained photos of 20 of those species. A total of 249 butterflies were observed, with Monarchs the most numerous at 42 total. And in a new category of listing, we had 7 species of butterflies land or perch on our fingertips. Try that on a bird survey! To see our survey results, click on our Butterfly Count Field Card. 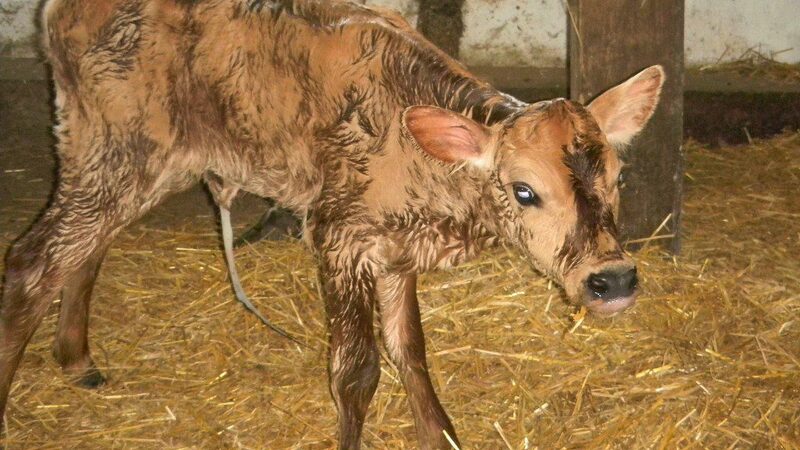 The newborn calf at Coverdale Farm tests its wobbly legs for the first time. Image by Jan Vincins, August 18, 2011. 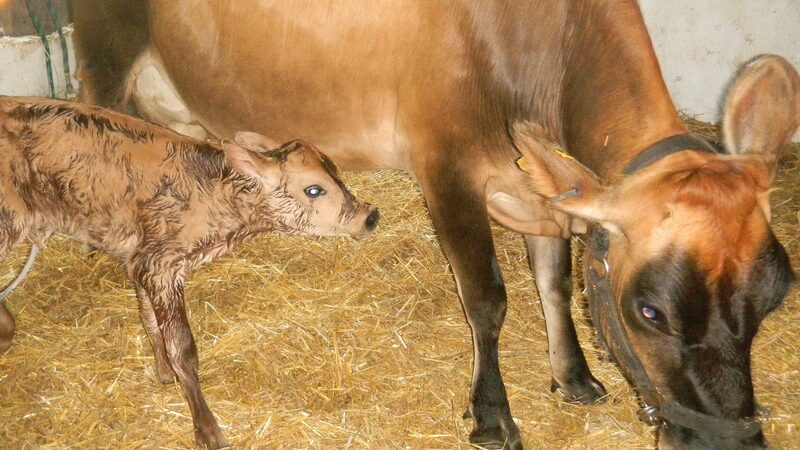 Today the summer camp groups at Coverdale Farm enjoyed a very special treat: a newborn calf! The Jersey cow, a dairy breed that is utilized in Coverdale’s education programs, gave birth to a female calf this morning around 10:00am. The mother did a great job of licking and tending to her newborn, as this is the second calf for this cow. The newborn calf with her mother in the barn at Coverdale Farm. Image by Jan Vincins, August 18, 2011. Jan Vincins, a Delaware Nature Society instructor, took great photos of this newborn as she led her campers in the “Big Red Barn” summer camp. The Big Red Barn at Coverdale now has one more occupant! If you are interested in meeting the newborn calf and the rest of the wonderful farm animals at Coverdale, come out this Saturday, August 20, for the special Farm Fun Day. The event runs from 8:00am until Noon, and you can help with the feeding of the animals. Farm Fun Day is free for Delaware Nature Society members.